Read earlier reviews of Café Westend before late 2018, and you might find yourself looking elsewhere for your cake and cappuccino. However, September of that year saw new owners and refurbished premises, and the response is now quite different. A location at the junction of Vienna’s main shopping street and an incredibly busy 6-lane road seems to hold little promise. But once inside, the traffic is inaudible (unless a motorcyclist gets overzealous on the accelerator). Sit at a window, and you can watch the world rush past in a silent frenzy while you dab at the remaining crumbs of your Sachertorte. The colours, fittings, and furnishings all combine to create a relaxed ambiance that manages the trick of marrying quite opposite impressions. For example, contemporary photos dot the walls, but the ceilings have the decorative stucco and botanical motifs you associate with city salons from the time of the monarchy. So traditional, yet modern. And those ceilings and walls are perfectly pristine, while the chairs and tables are a little worn. So classic, yet cosy. At first look, the furniture feels uniform, but look again and subtle differences abound. My table had a brass leg screwed into the floor. Others rested on decorative wooden pedestals. And the characteristic bentwood cafe chairs came in different styles, all evoking (to me, at least) a turn of the century feel and flair (and I don’t mean the year 2000). The high ceilings and tall windows ensure a bright airy feel. And yet the hardwood, beige and olive green colour scheme adds a subdued intimate touch. Talking of intimacy, the table and upholstered seats I sat at were quite narrow. If you’re at the larger end of the size spectrum, you may want to pick your location carefully. Anyway, all of the above is, frankly, irrelevant when you know the coffee cups feature a man in tails riding a giraffe. The staff are young and more diverse than in some of the other traditional cafés. It was, admittedly, not busy when I arrived for breakfast. But the waitress was quietly friendly, admirably swift, and subsequently unobtrusive but attentive. My minimalist “Wiener” breakfast egg was done to perfection, and the butter for my two rolls reached an acceptable 7/10 on the spreadability index (the only index that counts). The menu for lunch and later featured a few basic, traditional snacks and meals (e.g. Tafelspitz and Schnitzel), but also a burger and fries…illustrating once again the combination of old and new, modern and traditional. Café Westend prices are fairly standard. A breakfast cappuccino and a croissant cost €5.80, which is not far off what some of the more central coffee houses charge just for a coffee. In summary, excellent decor and ambiance with a bit of the common touch about it for those a little more price conscious. If there’s one coffee house that’s easy to reach by public transport, then it’s the Westend. It’s opposite Westbahnhof, one of the biggest railway stations and transport hubs. Subway: The U6 and U3 lines both stop at Westbahnhof. Head to the “Innere Mariahilfer Straße” exits and take the left-hand one as you leave the underground part of the station. 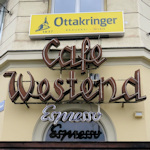 One you emerge, look along the street behind you and you’ll see Café Westend just a few yards away. Tram/bus: Tram lines 5, 6, 9, 18, 49, 52, and 60 all stop at Westbahnhof (told you it was big) and you should more or less see the coffee house when you get off. At the time of visiting (January 16th, 2019), open daily from 7 am to 11 pm on weekday, 8 am to 11 pm at the weekend.